Little Rock-Pine Bluff, AR - Accident News and Resources including car, bicycle, motorcycle and truck accidents and much more. Little Rock, Arkansas, nicknamed “The Rock” and “Rock Town,” is the capital and the most populous city in Arkansas. It is also the county seat of Pulaski County. Little Rock is a major cultural, economic, government and transportation center within Arkansas and throughout the South. Pine Bluff, Arkansas, is the largest city and county seat of Jefferson County, Arkansas. Pine Bluff is the ninth largest city in the state of Arkansas. The city is situated in the southeast section of the state in the Arkansas Delta. Its topography is flat with wide expanses of farmland. Pine Bluff is home to a number of creeks, streams, and Bayou Bartholomew, the longest bayou in the world, and larger bodies of water such as Lake Pine Bluff, Lake Langhofer, and the Arkansas River. Little Rock and Pine Bluff have a humid subtropical climate, with hot, usually humid summers, and short, cool winters. They experience a prolonged spring wet season, with frequent heavy rainfall from March to May, and a secondary wet season peaking in November and December. Thunderstorms can occur any month of the year, but are especially frequent and severe in spring when torrential rainfall, damaging thunderstorm winds, hail, and tornadoes are all threats; a secondary severe weather season peaks in November. The major industries in the region are agriculture, aviation, and healthcare. Major employers with headquarters in the region include Dillard's Department Stores, Windstream Communications, Acxiom, Simmons Bank, Bank of the Ozarks, Rose Law Firm, Central Flying Service and large brokerage Stephens Inc.
Interstate 30 runs from I-20 west of Fort Worth, Texas, northeast via Dallas, Texas, and Texarkana, Texas, to I-40 in North Little Rock, Arkansas. Interstate 430 is a 12.93 miles long Interstate highway in Pulaski County, Arkansas that bypasses the cities of Little Rock and North Little Rock. Interstate 530 is a spur route of the Interstate highway system, traveling 46.65 miles from Little Rock at the junction of Interstate 30 and Interstate 440 in the northwest, to Pine Bluff in the southeast. Interstate 630 is an east–west connector within Little Rock. It starts at Interstate 30/US Route 65/US Route 67/US Route 167 and travels west through downtown Little Rock to Interstate 430. Interstate 40 is an east–west Interstate Highway that has a 284.69-mile section in the U.S. state of Arkansas connecting sections in Oklahoma to Tennessee. Interstate 440 in the central part of the U.S. state of Arkansas, is a partial loop of 9.96 miles connecting I-40 with I-30 and Interstate 530 near Little Rock. Arkansas Good Roads is an organization that works to promote the development and maintenance of a safe and efficient transportation system. The Bill and Hillary Clinton National Airport is the largest airport in Arkansas, served by seven major airlines and utilized by almost three million air travelers each year. North Little Rock Municipal Airport is a public use airport in Pulaski County. Grider Field is a city-owned, public-use airport located four nautical miles southeast of the central business district of Pine Bluff. The Central Arkansas Transit Authority (CATA) provides public transportation services to the Little Rock metro area seven days a week with fixed route and paratransit operations, and a downtown historic streetcar system. Little Rock-Pine Bluff aircraft accidents. When someone has been injured or killed in an accident, grief support services and counselors help those involved begin dealing with stress and loss. It can be comforting to talk with others going through a similar situation, and the road to recovering from the loss may go more smoothly. Go here to learn about regional grief support services. After someone has been injured or killed in a motor-vehicle crash in Little Rock or Pine Bluff, many decisions need to be made immediately and questions need to be answered. For example, how much of the medical costs will be covered by the insurance policy? How does PIP insurance help with medical bills immediately? What if the at-fault driver has no insurance? After a serious crash, it is crucial to get help from a Little Rock injury attorney who understands the local regulations and legal standards, who knows how insurance policies work when an injured person is out-of-network, and who can handle all aspects of an insurance claim so the injured person can focus on recovery. If someone is killed in a collision, a Little Rock wrongful death attorney will launch a claim that will begin the process of financial recovery for the family members left behind. 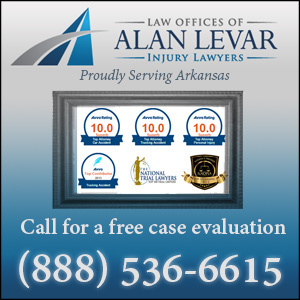 Learn more here about what a Little Rock personal injury attorney can do to help. Received Low Settlement Offer from Insurance Company: What Now? Car Accident Claim Exceeds Insurance Policy Limits: What Now? You may have never heard of the term “spinal stenosis,” but if you or a loved one has been involved in a car accident at some point in your life, you may be at risk for developing this painful condition. We are proud to announce that the Law Offices of Alan LeVar is partnering with the University of Central Arkansas and Recycled Bikes for Kids to collect bicycle helmets! Understanding dog leash and bite laws can help people keep their dogs in control as well as help people who have been bitten to seek the right compensation for their injuries. We’ve gathered data from the past 5 years to help you remain cautious of how and where you drive in Arkansas. Any attorney is going to tell you there are better odds for you if you hire a professional to represent you. But, what is the reality? Do you need one? 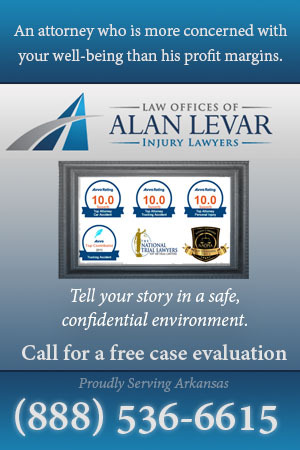 If you are that victim, you may be worried about filing a personal injury claim. Is it worth your time? Will it result in any real value to you? Most insurance companies will send settlement offers like this in the hopes you will decide it is easier to just accept it and move on. Do not do this. Generally, the other driver’s insurance policy will handle your claim for compensation. When your damages come to more than the insurance policy limits, you may have a problem. Because children are so vulnerable to danger, we also want to keep them safe in our cars. For that reason, we have gathered up the Arkansas child seat laws to ensure your children are kept safe from harm’s way.